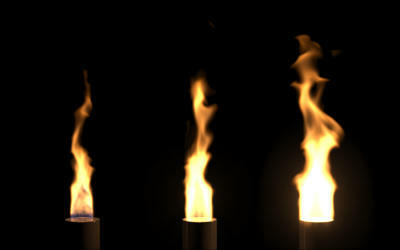 We present a physically based method for modeling and animating fire. Our method is suitable for both smooth (laminar) and turbulent flames, and it can be used to animate the burning of either solid or gas fuels. We use the incompressible Navier-Stokes equations to independently model both vaporized fuel and hot gaseous products. We develop a physically based model for the expansion that takes place when a vaporized fuel reacts to form hot gaseous products, and a related model for the similar expansion that takes place when a solid fuel is vaporized into a gaseous state. The hot gaseous products, smoke and soot rise under the influence of buoyancy and are rendered using a blackbody radiation model. We also model and render the blue core that results from radicals in the chemical reaction zone where fuel is converted into products. Our method allows the fire and smoke to interact with objects, and flammable objects can catch on fire. 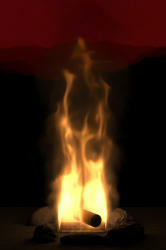 "Physically Based Modeling and Animation of Fire".